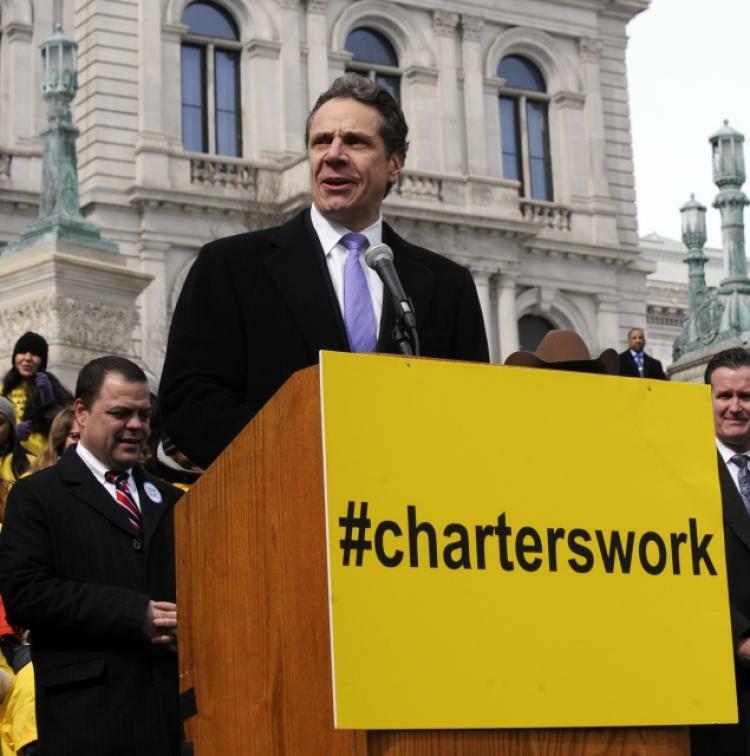 The Post pointed out that our good buddy Andrew Cuomo is taking a ton of cash from charters, and that's public record. Of course that's not the image Cuomo has been pushing lately. He's our good buddy, I hear at the DA. He's making nice. Now it would be nice if we could take credit for that and say that Public School Proud caused a complete turnaround. I have to say, though, that opt-out, which we've failed to support, is a big factor. Parent activists kept their kids home from Cuomo's stupid tests in droves. They forced him to put off counting the tests for their kids. In fact, some of them didn't even count against teachers in Cuomo's junk-science based evaluation system. But not all of them, as all high school teachers know. Not only that, but he just came up with a program under which NY residents can go to college tuition-free, under certain circumstances. You have to live here for a while, and you have to make it through on time, and a whole lot of people don't do that, but there you are. It's a whole lot better than nothing, which was the previous plan. He's also standing up on health care. He's very much against the GOP plan to dump Obamacare, give a tax break to the uber-rich, and screw tens of millions of Americans, New Yorkers included. Oddly, like UFT leadership, he doesn't mention Trump by name. This is in stark contrast to Bill de Blasio, who seems to be running a winning campaign against Donald Trump. No one even seems to know who his opponents are. After Hillary managed to lose the Presidential election to the least popular politician in human history, Governor Andy had to rethink his image. After all, he started out by saying he would go after unions. Now, as we face Janus and some serious survival issues, he's moving to make union dues completely tax-deductible. Governor Andy has presided over two education laws that affect us all. Every teacher in New York City is dancing around the Danielson Rubric and trying to be highly effective. With the first law, Cuomo actually stood up for us as our good pal Senator Flanagan, the one to whom we actually donate money, tried to reverse seniority rights for NYC teachers only. (Evidently the teachers in his district don't like that sort of thing.) 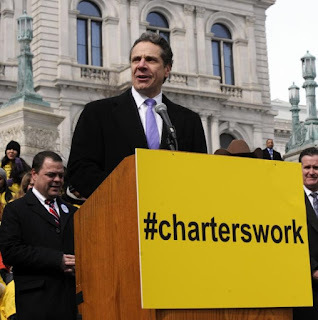 Cuomo opposed it because his new law was going to fire teachers. When it didn't fire enough of them, he called it "baloney" and worked on a new law. Make no mistake, these laws are designed to fire teachers. That was Cuomo's explicit demand. UFT leadership can dance around that as much as they wish. They can cite stats of how few teachers are rated ineffective. They can ridicule those of us, like Carol Burris, Diane Ravitch, and the American Statistical Association who say these things are nonsense. But if you're a poorly rated teacher, that's cold comfort. In fact, the pressure is palpable on those of us out there doing the job, no matter how we're rated. Morale is at an all-time low and this Janus nonsense could not come at a worse moment. In case it isn't clear, here's the thing about Andrew Cuomo--he's an opportunist who will say absolutely anything to advance himself. Cuomo supports the millionaire's tax these days but opposed it before. But perish forbid you should raise it, says Cuomo, because they'll leave New York. Snowflakes. Let them move to Utah and watch the Mormon Tabernacle Choir instead of the opera. When Cuomo said he would go after unions, I decided not to vote for him. Of course I didn't vote for his opponent, frothing-at-the-mouth Carl Paladino. And last time I didn't vote for that creep who supported opt-out but opposed the Triborough Amendment. Both times I voted for Green Howie Hawkins. And last time in particular, I wondered how things may have been different if we'd supported brilliant, pro-teacher Zephyr Teachout in either the Working Families or Democratic primaries. We'll never know. I think that UFT and NYSUT will endorse Cuomo next year. I think they will do that largely to come to some agreement on Janus, if such a thing is possible. But Andrew Cuomo is a despicable worm. I don't know about you, but it would take something very close to a miracle for me to support him.